If you have foot pain, there are many options for Plantar Fasciitis Treatment that you can choose from. Most of them fail to make a lasting difference, if they work at all. The most commonly recommended and prescribed methods, unfortunately, fail to cure Plantar Fasciitis. ...the way our body actually works and heals leaves our structure primed for more tightness, more pain, and more damage in the future. Rest takes pressure off the foot structure, and limits irritation of affected tissue. This also stalls or reduces the Process of Inflammation. Due to the nature of Tendonitis, Rest does not and can not fully heal the 'problem'. When you get back on your feet, it is predictable that you will soon start to experience pain again. Anti-inflammatory meds and Pain Killers basically just mask or dull your pain. They don't alter your structure or your physical habits to make you functionally better nor function in a way that will prevent the future onset of foot pain. Corticosteroid Injections may reduce pain temporarily as the reduce and/or mask the results of Inflammation. Also, they can make you hurt even more, and they have potentially dangerous side effects. Splints and Braces can help limit ongoing irritation to your structure, but will ultimately just prolong your suffering. Icing, as Doctors recommend it, just isn't enough to do the job. Using an ice pack, three times a day for 15 minutes each isn't going to help enough to really turn things around. See: How To Reduce Inflammation. Acupuncture, Massage Therapy, and Physical Therapy can be very effective choices as a Plantar Fasciitis Treatment -if- you have a highly skilled and knowledgeable practitioner. Energy work like Reiki has been known to help. EFT, or Energy Tapping, has been known to help. In the realm of finding practitioners (this includes regular doctors), you're on your own. The results you get really all depends on the individual skill and experience levels of the professionals you seek out. And, some treatment methods are just doomed to fail because they are NOT THE RIGHT TOOL TO DO THE JOB. Good news or Bad news, you have to try them out to find out if they're effective for you or not. Regardless of the treatment you try, from day to day you're going to continue to do the things that 'caused' your Plantar Fascitis. Part of an effective Plantar Fasciitis Treatment is getting rid of the pain, and the other part is actually 'fixing' the problem. Still another part is 'Managing' your structure over time in direct relationship to what activities you do and how irritating they are to your structure. Plantar Fasciitis is caused by many factors, like posture, foot gain, physical mechanics, overall health and nutrition, weight, etc. To get rid of your foot pain and problem, you need to reverse the Pain Causing Dynamic, and correctly target the sources and causes of each of your different Plantar Fasciitis Symptoms. Nutritional Insufficiency/Deficiency: If the body doesn't have the building blocks it needs to function optimally, then it's various systems can't work optimally, and you end up in pain. On the DVD 'The Plantar Fasciitis Treatment That Works' (and the Support Email Series that comes with it), you learn how to effectively reverse each of the above three factors that are contributing to your foot pain and problem. The #1 Option....a.k.a. Super Icing! 1. Get a large plastic tub or the equivalent. Something that you can fit your entire foot into, even better if you can fit both feet in. 2. Fill the bucket most of the way with water and ice, or water and frozen water bottle(s). 3. Once it gets ICE COLD, dip your foot into the bucket of ice water. 4. Notice that I said 'dip'. Dip your foot into the ice water for 5-10 seconds. 10 seconds -only-. 5. Take your foot out after 10 seconds. 6. Repeat this at least 10 times per day. I suggest doing this 10 times within a two hour period. You are going after the CUMULATIVE effect of the anti-inflammation properties of Ice Dipping. I urge you to treat this as a serious experiment for 7 days. Not only will it make me look good, but your feet will feel amazingly better if you do this for a week. WARNING! : It can take up to 2, 3, or 4 days to feel benefit. There is a lot going on in your structure, it can take a while for all that to reverse. At a certain point, you will turn a corner and feel great benefit. That was a bit of free advice....it seems simple, but don't dismiss it because of that. Also, it wouldn't hurt to see the Magnesium For Tendonitis page. 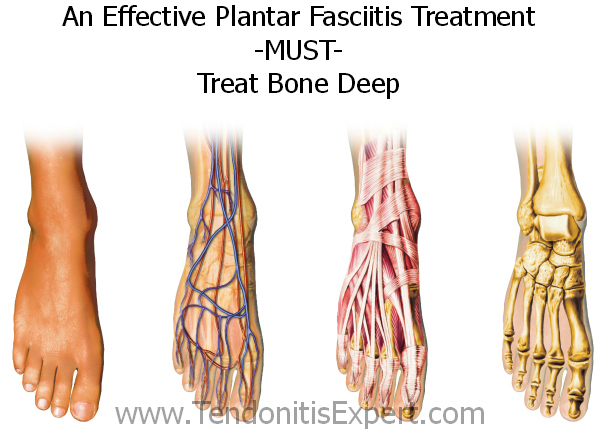 Return to the top of this Plantar Fasciitis Treatment page. Go to the Plantar Fasciitis page.